Bildurn has won permission to convert the now vacant Gresham Hotel at 99-107 Carrington Street, by the train station in Nottingham, into flats. The upper floors of the building are marked for residential use as the lower are occupied by 200 Degrees Coffee and Superdrug. bed flats and 14 two bed flats. A planning statement reads: “The upper floors of the property are currently vacant and would require substantial upgrading to make them suitable for continued use as hotel bedrooms. “In order to safeguard the future of the Gresham building it is considered necessary to find an alternative viable use for the upper floors. 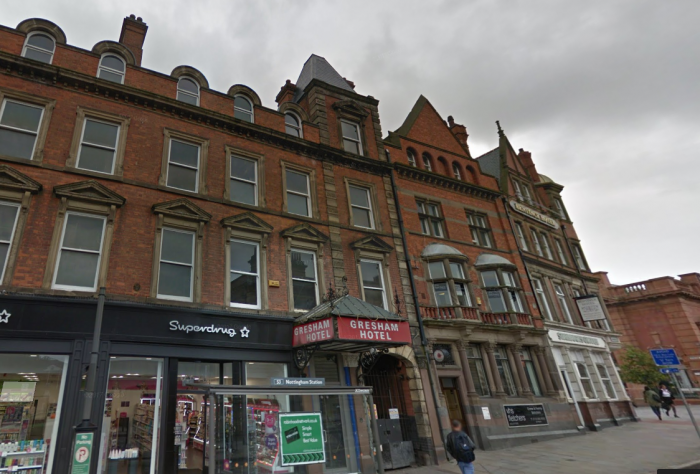 “The City Council has a policy of encouraging residential accommodation on upper floors within the City Centre and there are many examples of similar buildings within the Centre where planning permission has been granted for flats in recent years.